I've seen several ideas via blogland and pinterest on how-to-create-an-art-display-board. Using what was already on hand, I created two display boards, one for each kid. 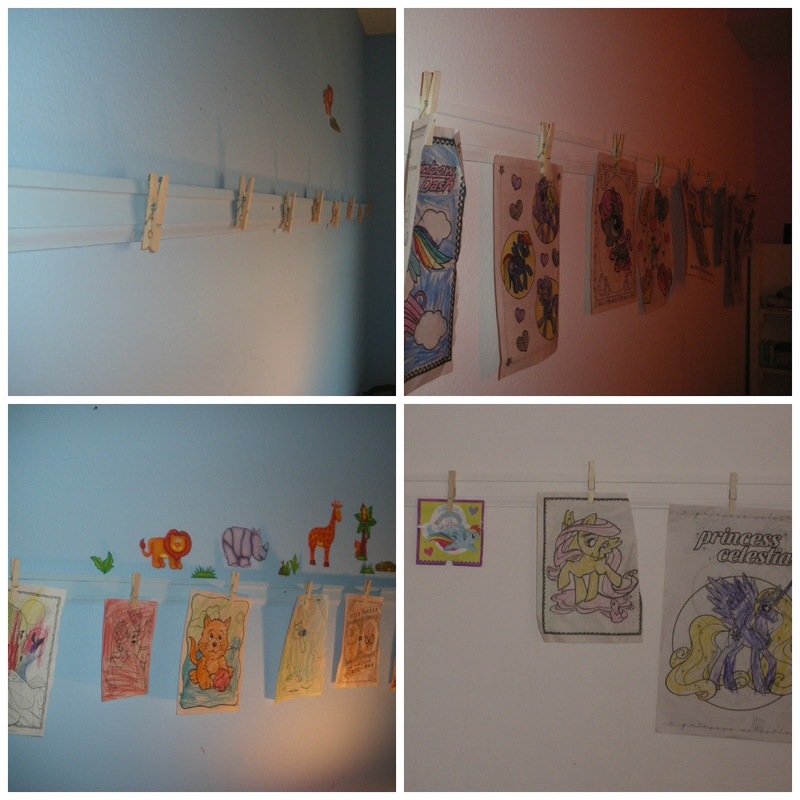 Zoo Animal Wall Clings are from Dollar Tree. 1. I tried sealing the baseboards with this spray that's been used frequently. Unfortunately, the tip was a bit clogged, and instead of cleaning it...I just kept spraying, resulting in an uneven spray pattern. Its a bit tricky to see in the pic below, but the light board needed touch up paint over the globs of sealant that dried discolored. :( Lesson learned: always take the time to clean the spray paint nozzle. 2. Knowing that these display boards will see alot of traffic, I tried to secure it to the wall with screws. Not sure if all baseboard is pressure treated or if this was super hard wood (curb side pick-up find) but I could NOT get the screws in! After stripping 6 screws I finally gave up and went with nails. Not only was this WAY quicker it was also easier. I inadvertently taught my kids a lesson in how to handle frustration. Lesson learned: don't force a screw, know when to move on to plan B.
I love this idea!! Very cute and fun!